Policy Ambassador Programs are one popular approach to policy enforcement that does not require the use of citations or fines. Student Ambassadors are trained to approach tobacco users on campus in a non-confrontational and friendly way. Campuses take two broad approaches to enforcement: educational approaches and punitive approaches. Campuses typically spend the first year of a new policy focusing on educational approaches and then use punitive approaches (citations and fines) as needed after that. Defining policy success is essential to effective compliance and enforcement. Setting data-based goals is important when assessing whether or not your campus should do more to increase compliance. There are many things that a campus can do to increase policy compliance, however, putting time, energy and funding into launching a new policy is one of the most effective strategies to achieve policy success (see the Launching a New Policy page). A Policy Ambassador Program utilizes student, staff, and faculty volunteers to approach tobacco users on campus and inform them of the policy. Policy Ambassadors are trained and provided with support. Training and support materials are included with this Toolkit. Download the full kit or just the section that you need below. Download the full 52 page kit for all the information, tools, and resources you need to develop and implement a policy ambassador program on your campus. This first section of the toolkit reviews the latest compliance research, outlines recommendations, and provides a timeline for the year. Resources include an Ambassador application, position description, and interview questions. The section outlines the different activities and roles that your Ambassadors will accomplish throughout the year including conducting outreach events and campus rounds. This kit includes the tools and resources you need to conduct a 30 people campaign on your campus. As described in the Ambassador Activities section, a 30 people campaign recruits volunteers to approach tobacco users on campus. This packet includes all the resources and materials your Ambassadors will need to conduct campus rounds and approach tobacco users to inform them of the policy and campus resources to quit. There are many ways to increase compliance with a tobacco-free policy. Take a look at some of the strategies that have already been tried and what has worked well at other campuses. This fact sheet explains how public colleges and universities in California can use citations and fines as a tool to enforce smoke and tobacco-free policies, in order to better protect and promote the health of their students, staff, and visitors. Have volunteers, campus police, faculty, staff, and administration hand out this reminder card to anyone seen smoking or vaping on campus during the first year of a new policy. 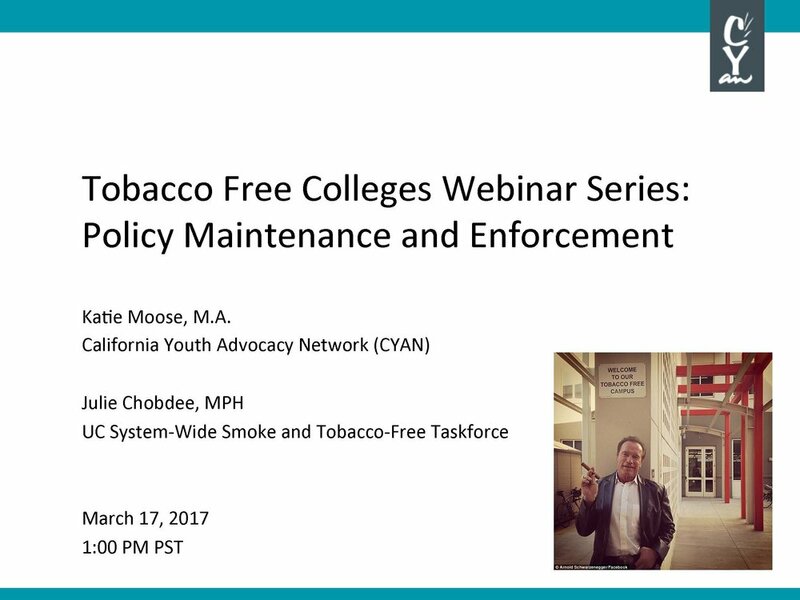 This webinar showcases two education-based approaches to tobacco-free enforcement: a Policy Ambassador program at UC Davis and a 30-People, 30-Day Campaign at Ohlone Community College.